The City of Sandusky has a unique location on the southern shore of Lake Erie midway between Cleveland and Toledo. Probably best known as the gateway for Cedar Point, Sandusky offers small town living with easy access to both of these major urban areas, plus some interesting attractions of its own. Sandusky continues its downtown renaissance as a cultural and recreational destination with quality shopping, dining and entertainment for residents and visitors to enjoy. The distinctive historic architecture, beautifully-landscaped parks and friendly atmosphere offer a charm that makes Sandusky a memorable place to visit. In front of the county courthouse in Sandusky is a water fountain that features a statue of a boy holding up a boot. That statue became the official symbol of Sandusky. The original statue was first installed in 1895 and stood in the same location. The statue now standing in the middle of the fountain is a reproduction of the original. The original zinc statue is now in the atrium of the City Building. While some think the Boy with the Boot might represent that the boy pulled the boot from Lake Erie while fishing, that's not quite the story. In 1895 there was a small park across the street from a hotel owned by Voltaire Scott at the end of Wayne Street. He wanted to improve the park so his guests might have a better view. At his own expense Scott placed the statue of the Boy with the Boot, surrounded by 4 other statues that included dolphins and maids. In the evening Scott Park as it became known, was illuminated by colored lights. 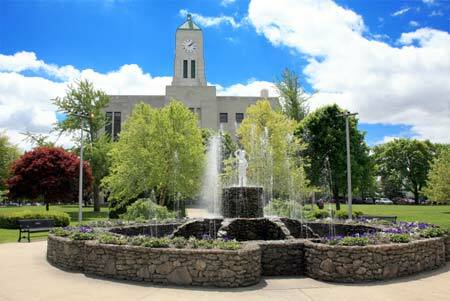 When Scott died, he willed the fountain to the city, along with funds to maintain the fountain. But in 1924, the fountain was severely damaged by a tornado. The Boy with the Boot was moved to a city greenhouse. The park was turned into a parking lot in 1935, but that wasn't the end of the story. The statue was placed in a similar place of honor in front of the new county courthouse in Washington Park. In 1982, the statue was placed on the National Register of Historic Places, but in the 90s, the statue was damaged by vandals. This time a replica statue was cast of iron to replacing the original which had been moved to the City Hall building on Meigs Street. If you look closely at the statue you realize that the boot didn't come from the bottom of Lake Erie, but it is the boy's own boot that filled with water after playing in the fountain. Fort Sandusky was a British trading and military outpost established around 1794. The Native Americans inhabiting the area were the Seneca, displaced at the outset of the American Revolution. The generally accepted theory is that the name "Sandusky" is an Anglicization of the phrase "San Too Chee," meaning "cold water." A less accepted theory is that the that the city was named after a Polish fur trader by the name of Antoni Sadowski or Jacob Sodowsky. The Greater Sandusky area was a safe haven and a new start for refugees of the Firelands refugees of the Revolutionary War in Connecticut. Norwalk, the Huron County seat (just south of Erie County) is named for Norwalk, Connecticut, as is New London, a small town south of Norwalk. Sandusky was a major stop on the Underground Railroad. Many slaves seeking to reach freedom in Canada made their way to Sandusky, where they boarded boats crossing Lake Erie to the port of Amherstburg in Ontario. Sandusky was the largest ice producer west of New York City during the latter half of the 19th century. Noted for its solid, "crystal blue, clear as glass" ice, the city became known as the "Ice Capital of the Great Lakes." Icemen eagerly watched the waters of Lake Erie until they froze to a depth of 8" - 16". 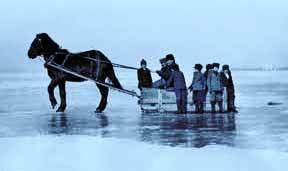 For as long as "good ice makin' weather" held, Sanduskians endured 10 hour days of harsh winds and frigid temperatures for a daily wage of $2. Sanduskians retrieved about 400,000 tons of ice each winter. The greater portion of the harvest was stored in some 50 sheds that dotted Lake Erie's shoreline. Sandusky provided most of Ohio's cities with ice. According to the local paper, Sandusky's "crystal quality put the murky, sewer-tainted" Cleveland ice to shame. Most of the ice was shipped across the lake as needed from a string of icehouses located on Put-In-Bay's Peach Point. But ice dealers from distant cities as far away as St. Louis took advantage of the cold weather and shipped their ice by rail immediately. As many as 500 ice-laden cars departed Sandusky each day during the season. For years Sandusky had a thriving commercial fishing industry that specialized in perch. Although the large fish houses have long gone from the area, even today, Sandusky is the center of recreational fishing. 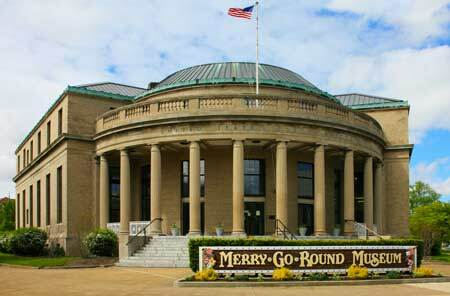 Located in the former Sandusky post office, which architecturally, is a perfect spot for the Merry-Go-Round Museum. Visitors of all ages can enjoy a fun and relaxed atmosphere while touring the Merry-Go-Round Museum, where you'll learn about the history and art of the carousel. Hear an authentic "oom pa pa" band organ playing that you won't believe isn't amplified. Plus, you'll see a wide assortment of the "painted ponies" on display and get to ride on one of only about 200 original wooden carousels left in the country. The Maritime Museum of Sandusky contains exhibits on shipwrecks, navigation, Sandusky's boats of the Underground Railroad, plus recreational boating, passenger boats, and boat building. The museum also includes commercial fishing, commercial shipping, ice harvesting, and Cedar Point's maritime history, plus a few other odds and ends. Throughout the year the museum offers several programs including the Wood Boat School that teaches boat-building and boat restoration. The museum is located at 125 Meigs Street across from the battery in downtown Sandusky. The Follett House Museum is home to an interesting collection of local history that documents Sandusky and Erie County from its earliest days up through the present. Housed in a magnificently preserved 1830s limestone building that was once the home of Oran Follett who, was once the publisher of the Columbus Journal. Oran also published the famous Lincoln-Douglas debate transcripts. The museum is operated by the Sandusky Library and includes displays from the War of 1812, historical paintings, maps, photographs, dresses, and some most unusual household gadgets. Visitors to the museum can tour at their leisure or take a guided tour. The museum is closed during between January and March.. The Firelands have nothing to do with the land ever being burnt or oil wells catching fire. It all dates back to the Revolutionary War and events that took place in Connecticut. During the American Revolution Connecticut citizens manufactured supplies for the Continental Army. While of no strategic importance, the British tried to destroy these areas through a series of raids. The raids got out of hand and many homes, churches and schools were destroyed. People who lost property had no insurance and no federal disaster grants to help them rebuild. One example of the destruction could be found in the history of Norwalk, Connecticut. In July, 1779 it was raided and 80 of the 86 dwellings in the town were burned to the ground including two churches, 87 barns, 4 mills and 5 vessels. During this time period other towns raided including New London, New Haven, East Haven, Greenwich, Danbury, Fairfield, Ridgefield and Groton. After the war, the Connecticut legislature was petitioned by residents who lost property during the war. They were called "Fire Sufferers" and their appeal was referred to a legislative committee which reported that they should be paid, but the state was without funds to do so and the only option was to transfer title on some of the lands that had been chartered to Connecticut in 1662 in what was called the Royal Charter, which roughly gave the colony of Connecticut the European legal rights to a very narrow swath of land running across North America from the Atlantic to the Pacific coast. Of course, at that time, the European powers had no idea of how much land that included, or if there were anyone else already living on the land. At that time, they considered themselves the legal heirs of the land simply because they claimed that right. In time those rights would be enforced through armed conflict between nations and peoples. After the American Revolution and the formation of the federal government, claims by various states were made on the lands west of the original colonies which had by then become the original 13 states. The federal government decided that instead of having 13 very large states stretching from coast to coast, it would create new states as it became feasible. That meant the claims on western lands by various states had to be settled. In that settlement Connecticut kept only a narrow tract of 120 miles along on the southern shore of Lake Erie, which became known as the Western Reserve. Instead of paying the Fire Sufferers cash for their damage claims, they were given land at the west end of the Western Reserve. Claims totaled $500,000 in 1792 dollars and the land was allocated at a value just over $1 per acre. Several major problems had to first be solved: paying off the Indian tribes who also had been given claim to the land through negotiated treaties, and once that was done, surveying the land so it could be sold off in more manageable tracts. This would take some time to accomplish. It wasn't until 1808 that the land became available. By then most of the Fire Sufferers had died or sold their claims to land speculators. Few of the actual Fire Sufferers ever saw the Fire Sufferers Lands. In time that name was shortened to just Fire Lands and today it is known simply as the Firelands of Ohio.